If you’re looking for an intergalactic start of the New Year, then we suggest you hop on board Uptown’s Sunday Galactic Bonus! 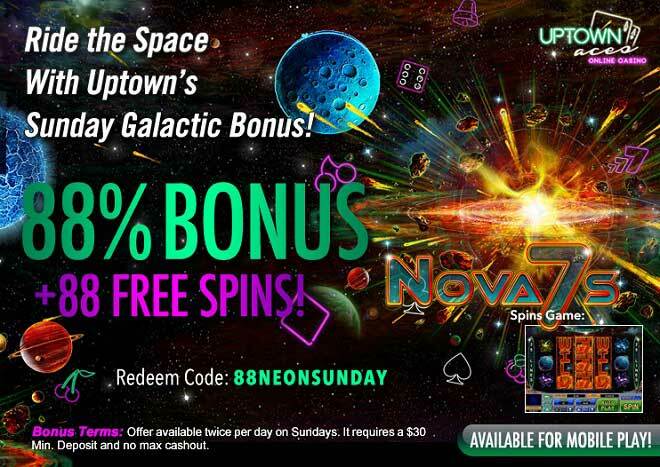 Party it up with otherworldly 2017 wins when you deposit as little as $30 twice per day on Sundays and you’ll be playing our popular Nova 7’s slot where wilds, multipliers and bonus features will send you on a winning ride in Uptown’s space! Kick off the brand New Year by collecting astronomical wins with a 88% Bonus + 88 Free Spins!